Garden watch or perhaps raptor watch : 10th Sept. record 5 Common Buzzards in the air together seen from garden. 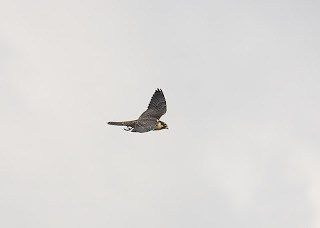 6th, 11th and 16th Sept. Hobby low through garden at 7.30am ish either SW to NE or reverse. After the excitement of the last couple of weeks I was due for a bit of a let down. I spent Tuesday morning staking out Dosthill in the hope that the reported Marsh Harrier would drift into Warks. in the event it didnt drift anywhere. I gave it every chance but I retired back to the car for Pork pie and crisps. Had I stayed a little longer I might well have seen Steve Haynes' 3 Gannets, an amazing record. So no Marsh Harrier and no Gannets. Some compensation was offered in the unmistakable form of Graham Mant who waved cheerily from the other side of the valley. Actually it must have been National Wave at somebody Day cos the people in an RSPB Land Rover also waved enthusiastically as they drove past on the other side of the river. They probably mistook me for someone else but it was very nice nonetheless. So how do we salvage something from the day? I know, lets see if we can dip the Rose coloured Starling again. Well I did my best. A car load of birders had come down from Barnsley to see A Spotted Crake somewhere and the Rose coloured Starling. Things must be tough in Yorkshire. After an exchange of ay ups I left them at the churchyard to walk round the estate. It was part of a cunning plan to avoid seeing the bird. It worked perfectly. I returned to find everyone going home with the satisfaction of having seen the bird perched on a roof right in front of them. I'm left with no bird and nobody to ay up with, apart from the ongoing 'What you looking at' from the local residents, everyone of whom claimed to had the Starling in their garden for the past month. I did see the Rose coloured Starling in flight eventually. On Wednesday the plan was to go to Stratford with an old friend of Jan's who now lives in Australia and who was spending a few days with us. It would also give me the opportunity of visiting Tony Shepherd who lives down that way. While we were catching up with news and having coffee we get a Mega alert. My worst fear (in a birding sense) had been realised. I was in the right place but everything else was wrong. I didnt want to ruin Jan and Ann's day but if there was a chance of seeing a new bird. Fortunately for me the bird had flown off which gave me a bit of thinking time. Tony's phones were going off two at a time as the embryo of a twitch began to develop. I rang Jan who was brilliant and suggested we bring the plan to visit Nuneaton market foward an hour, with none of that 'now is the hour of our discontent' attitude. (Well we were in Stratford.) With the Tufted Puffin not relocated we returned home. As far as I know there's still no sign of it, what a relief.